2009 & 2010 Touring models!!! This stand fits all 1989-2010 FLH and FLT Harley-Davidson Touring bikes. Unlike all other stands, the EZUP Center Stand allows the operator, while still on the motorcycle, to raise the bike onto the center stand without getting off first. Passengers can also get on the bike by themselves when it is parked on the EZUP Stand. Getting the bike off the stand is as easy as putting the bike in gear and driving away, even with a passenger on board. Installation is also very simple and takes about ten minutes with the bike parked on it's side stand. To rotate the rear wheel for cleaning, place a 3/8-inch spacer under the stand for lifting the tire off the ground. The Wheeldock EZUP Center Stand is built to last and features two self-lubricating I-glide bushings, a zinc-plated axle, and a pair of stainless steel return springs. This center stand is finished with gloss black, epoxy powder coating with a chrome foot lever for great looks and extreme durability. Our center stand comes with a lifetime warranty as well as a 60-day satisfaction guarantee. Available in 3 heights (1989-2008 models) for standard suspensions, lowered rear suspension or lowered front and rear suspensions. Model CS-1-C - Center Stand for STOCK Suspensions - Standard Height Model This model EZ-UP Center stand fits the standard height suspensions on 1989 and later Harley-Davidson touring motorcycles. 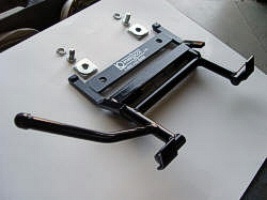 This is the center stand needed for all FL touring bikes which have the bow-tie brace welded between the frame rails directly below the transmission. NOTE: The length of standard height rear shocks are 12-3/4 inches. Measure the mounting bolts from center-to-center to check this dimension. NOTE: Does not work if True-Track is installed. Installs In 10 Minutes Or Less! Available for the Harley-Davidson touring models only. The Model CS-2-C is for LOWERED Rear Suspensions. 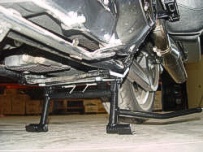 This model EZ UP Center stand fits the standard height suspensions on 1989 and later Harley-Davidson touring motorcycles with the rear suspension lowered. The EZ Up Center Stand fits all FL Touring bikes which have the bow-tie brace welded between the frame rails directly below the transmission. Made in the USA. Model CS-3-C is for LOWERED FRONT & REAR Suspensions. - This model EZ-UP Center stand is for Harley-Davidson touring motorcycles which have been lowered in the FRONT and REAR. This model is 1 inch lower than the stock center stand and fits the factory lowered FLHX Street Glides the FLHRS Road King Customs, and any touring model that has been lowered with the H-D Profile FRONT and REAR suspension lowering kits. Made in the USA. NOTE: Does not work if True-Track is installed. ... Installs In 10 Minutes Or Less! Available for the Harley-Davidson Touring Models only. Model CS-09 is for Stock Suspensions. - This model EZ-UP Center stand fits the standard height suspensions on the new 2009 Harley-Davidson touring motorcycles. This is the center stand needed for all FL touring bikes with stock suspensions and wheels. Finish is black epoxy powder coating with a chrome foot lever. Made in the USA. The Model CS-09-L is for LOWERED Rear Suspensions. 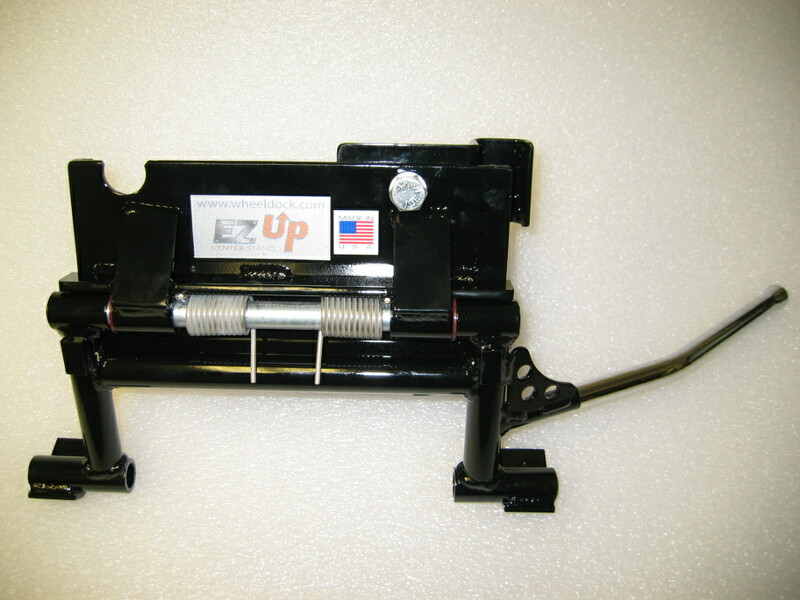 This model EZ-UP Center stand fits the lowered suspensions on the new 2009 Harley-Davidson touring motorcycles. This is the center stand needed for the Street Glides and other 09 bikes lowered with profile shocks and stock wheels. Finish is black epoxy powder coating with a chrome foot lever. Made in the USA.